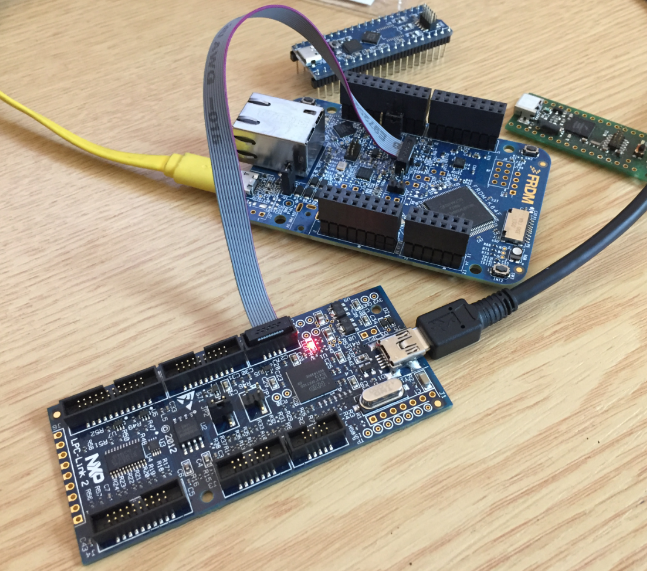 The idea was to run that game on a ‘normal’ ARM Cortex, and I selected the NXP FRDM-K64F board for this: the board is powerful enough and has an SD card socket so the game can load from the SD card. I started my port of Zork for the NXP FRDM-K64F board using the port from Thomas Shane. You can find my port for the FRDM-K64F on GitHub (links at the end of this article). It should be fairly simple to port it to any other board. If using the file system/SD card with FatFS: copy the file dtext.dat to the root folder of the SD card. If using Semihosting: this requires an active debugging session, so you have to start the program with the debugger. The program then accesses the dtext.dat from the host PC. The easiest way is to use the game data from FLASH memory (at least 128 KByte required). 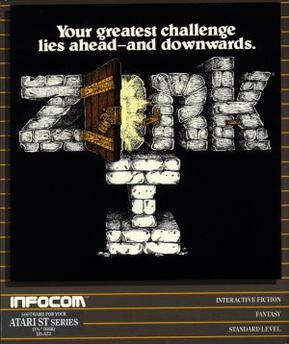 The game data gets loaded into FLASH as dtext.dat (file in the Zork folder). Have fun playing the game and exploring the dungeon! And if you don’t know how to solve one of the puzzles, there are plenty of hints online :-). 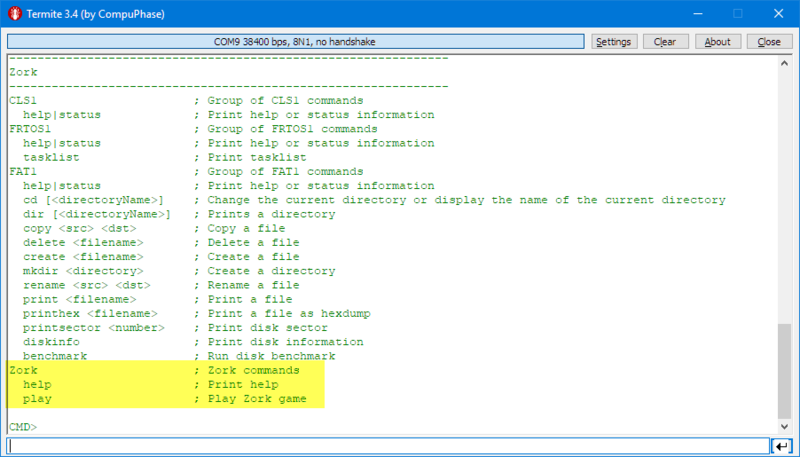 This entry was posted in ARM, Boards, CPU's, Eclipse, Embedded, FatFs, FRDM-K64F120M, gcc, Kinetis, MCUXpresso, MCUXpresso IDE, NXP, Processor Expert, Tips & Tricks, Tutorial and tagged ARM, arm gcc, Building, Eclipse, freedom board, FreeRTOS, gnu gcc, MCUXpresso, MCUXpresso IDE, NXP, open source projects, OpenSDA, technology, Tips&Tricks by Erich Styger. Bookmark the permalink. 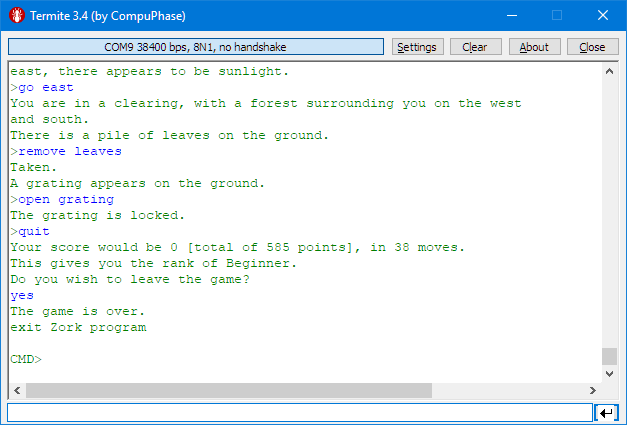 Of course, it is in fortran, which makes porting to an ARM difficult. https://github.com/Quuxplusone/Advent claims to have an ANSI C port of the game. thank you for these links!